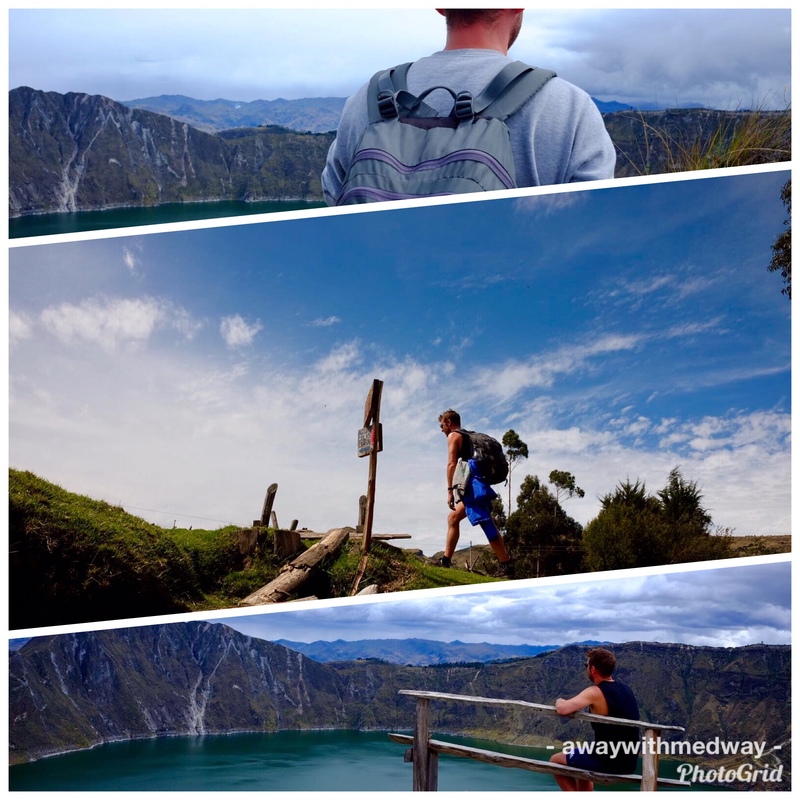 While travelling I have found blogs a very useful tool to guide you through each country and the Quilotoa Loop popped up as an experience not to be missed and having now completed it myself, I would say it was my favourite trek and activity in Ecuador. After a good nights sleep and more falafels for breakfast we pack our small rucksacks with enough clothing and supplies to last four days, but not too much to weigh us down while hiking. This was posing to be quite difficult, as the weather can change at any moment on the loop, from hot sun, to rain, to freezing cold. 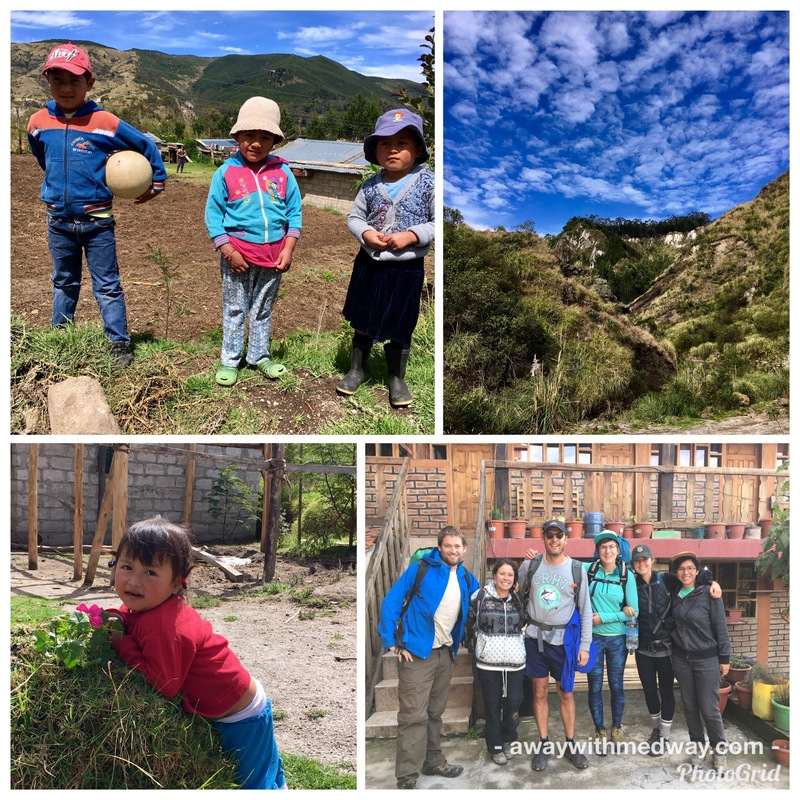 We load onto the bus at the bus main bus station and head to our first stop Sigchos, a little village 2 hours from Latacunga, and in the middle of high hills covered by little farms. It’s best to get the earliest bus possible which leaves at 7am, if not the 9am as there are only few buses that run to Sigchos. The earlier you start the better chance you have of avoiding the afternoon rain. The bus zig zags around the green hills, up one and down the next for what seemed like forever. Dose up on the ‘calms’ before if suffer with travel sickness. Off we set, like sheep following the gringos in front that seemed to know their way. Quickly we learn that its best not to rely on others and check the directions regularly, as one missed turn can mean crossing a river without a bridge and wet boots. The first days hike to Isinlivi is estimated to take between four and five hours, depending on your fitness and capability of following directions and is meant to be the easiest of the four days. One of the highlights of the loop is meeting other travellers that you get to know over the course of the four days. Today would be the day that I meet one of my favourite travelling couples, Lana from Bosnia and Ana from Mexico. Ana having recently injured her foot, meant that Lana had to carry by herself this massive rucksack – it looked like it was packed to last a month not four weeks. 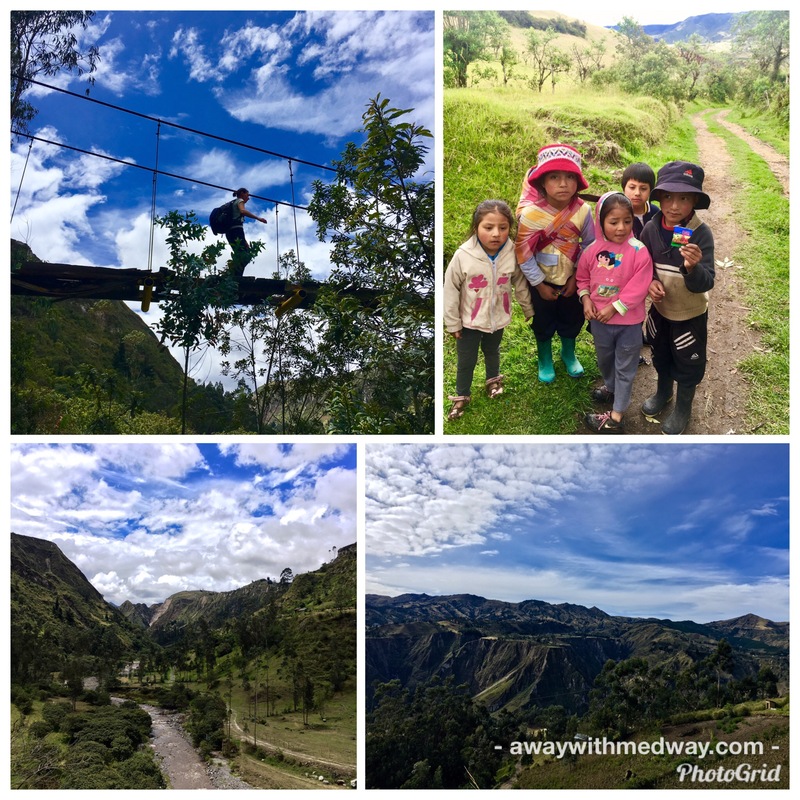 The first part of the trek was a gentle meander down the valley to the river, crossing the bridge and through the village. Really quite pretty and so far relatively easy. Well the easy part ended after taking the turn after the school, as it was all up hill by a good 200m to the top of the other side of the valley. Following the path that was also used by cow and mules, muddy in parts and steep in others, but really pretty. Stopping to catch my breath and looking across the valley the view was amazing and so different to any other so far, with patchwork or farms. We make it to the top after about two hours of walking just as the rain is about to start. On our way up we see some of the others from the group, who have taken a wrong turn, and start a long climb up a much steeper and tougher route. Arriving at our destination Isinlivi after just over three hours of walking, we are happy to find a happy welcome at the Llullu Lama hostel, a beautiful styled hostel that reminded me of staying in a ski chalet in the Alps. Maybe that’s because its run by an Ecuadorean-Dutch couple, the European influence definitely coming through. The real positive to Llullu Lama, wasn’t just the roaring log fire keeping everyone warm, but the jacuzzi, steam and sauna. Sadly the only the jacuzzi was working on my visit. But after a long trek, there was nothing better than talking to a group of strangers half naked while drinking beer. After good evening meal and delicious breakfast we were ready for day two of trekking. The sun was out again, and I had stripped down to just shorts and a vest, meaning I had to carry everything else. A group of eight of us left the hostel at the same time, all with the same instructions. We were all told to not follow the second instruction due to a landslide a few week previous, but to take a different route. Well, we may as well have not had the instructions as they made not sense from beyond that point. Instead of going down the valley to the river, we managed to go up, up and up and cross the valley at a different point. This making the route much harder, but far more beautiful than if we had just followed the river. Luckily a local lady told us to look out for the winding path down. Which we did and we found the river and some other lost trekkers. Although we had gone a much longer way, we all enjoyed it. Well except for Thomas the French guy. Who hated the fact that we were talking in English and not Spanish, or French. We all laughed when he took a wrong turn and was then chased by a dog and shouted at by the owner. We always knew the last part of the trek to Chigchilan would always be the toughest, what we haven’t planned for was the extra effort we had to put in earlier due to getting lost. The last part indeed was steep and long. But there was determination not to let Thomas reach the top before us. Even with his walking poles to aid him. Arriving at the Cloud Forest hostel, the mist started to cover the village and the temperature drop drastically. Now we understood why we needed our warm clothes. The only warm room was the main common room, that was full of about 40 people and smoke from the log burner. Tonight would be an early night for sure. Well not before a few beers with our fellow trekkers, discussing how we all managed to take different route to get here. 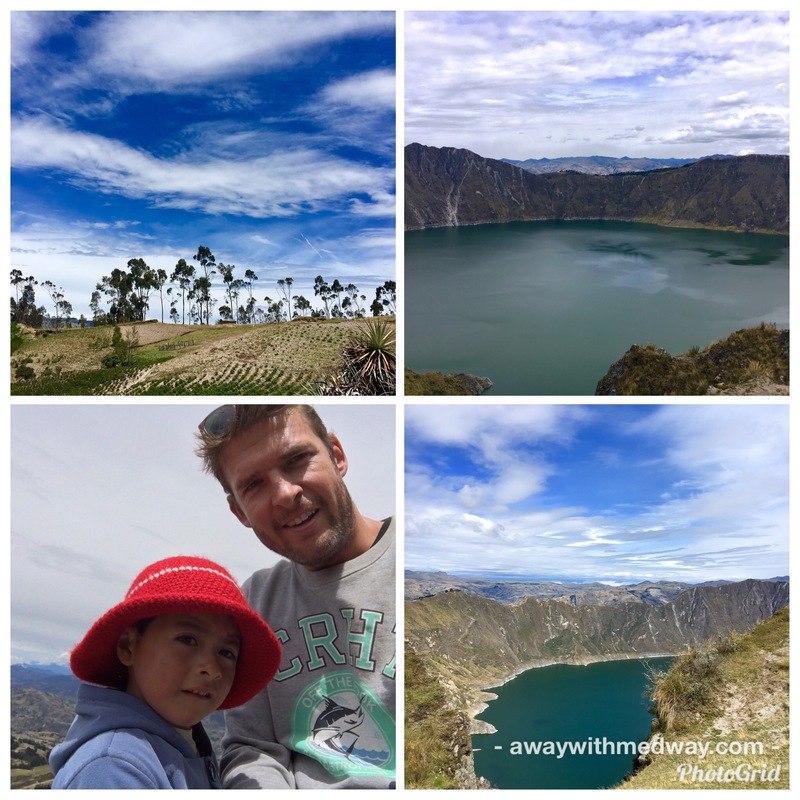 Day three and the day we would make it to the top of the extinct volcano Quilotoa and see what all the fuss is about. Having beaten the average time for the previous two days, we decided to take it easier today and walk with Lana, Ana, Joe and Faye. This time we were not going to get lost. Mainly because it was so well signposted along the way we didn’t need our instructions. Along this route as before we had lots of local children, offering to show us directions for caramel or sweets and aks for their foto to be taken. The cutest were brother and sister, Dennis and Viviana and their cousin Lesley. Not one of the children we met had what I would call a typical Spanish name, there were all western names. After about 2 hours walking across the most beautiful landscape, that looked like a patchwork quilt under a perfect blue expanse of blue sky, with the sun shinning strong. The weather couldn’t have been more perfect. Stopping for some food, the other fellow trekker’s Holly and Dan caught us up and joined the group. So far most of the trek has mainly been flat or down hill, zig zagging along the valleys edge. This is where the fun begins, as we descend higher towards 3700m and the volcano crater rim. Nearing the top of the sand track, I look back to see if I can see the others in the distance, but alas I cannot. Dan, Holly and myself had quickened are pace, and we could hear the sound of the dogs the others were disturbing as they descend upwards slowly. Reaching the top and seeing the expanse of green water that shimmered in the days sun was incredible. My first crater lagoon experience, and what a spectacular journey to get here. Pretty exhausted from the 4 hour trek, I rest and just take in the view. Just then a cute little four year old comes up from no where, with the cutest smile saying “foto, foto” and sits next to me and starts pressing my selfie stick remote. “Otro, otro” meaning another. Even little kids out here on the top of a volcano know how to work an iphone. Laura joins me with the others and we just rest and appreciate what we see before us. 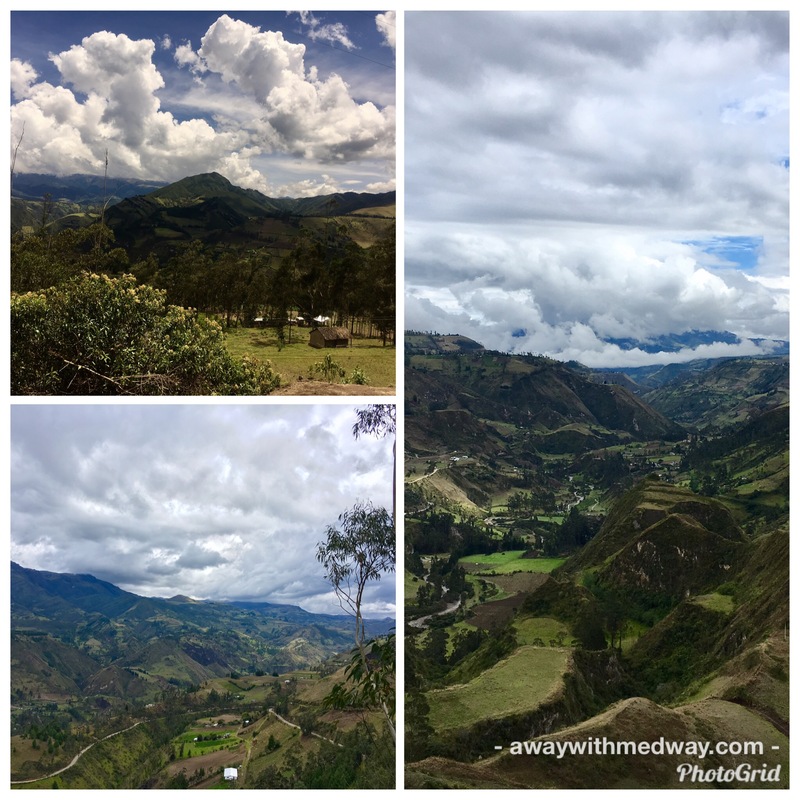 Also to rest, before the final one and half hour trek along the rim to the village of Quilotoa where we will spend the evening. There are two options you can take around crater to reach the town. One that takes 5 hours and reaches the highest point at 3900m and the shorter 3 hour route. We opted for the shorter one as the weather was turning and we made it in one hour thirty minutes . The alpaca hostel was our base for the evening, which turned out to be a great find. We got a room with two doubles beds for the price of a dorm. The log fire lit, we kept warm fully clothed under the three blankets, it was so cold. A night of playing cards around the log fire with our fellow trekkers Lana and Ana was the perfect end to a perfect three days. Yes it was a meant to be four days, but we decided to not trek the final day to Zumbahua. Mainly because we were exhausted and most of it was along a road.